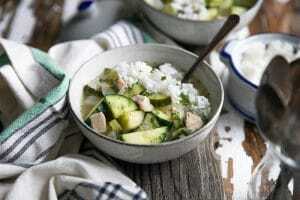 Inspired by my travels in Cambodia, this Pork and Cucumber Soup is easy, fast, and bursting with flavor! Place the olive oil in a large pot over medium-high heat. Add the chopped onion and sauté for 3-4 minutes, stirring occasionally, until onions are soft and translucent. Stir in the celery and cook with the onions for 2 minutes. Add the pork to the pot and mix well to combine. Cook, stirring frequently, for 3-4 minutes before adding the minced garlic, Italian seasoning, salt, black pepper, and chopped parsley to the pot. Stir well to combine and cook for 1 minute more. Add the water or chicken broth to the pot and bring to a boil. Add the chopped cucumber, reduce heat to low and cover. Simmer soup for 15-20 minutes, or until vegetables are soft and cooked. Ladle soup into bowls and top with additional chopped parsley, if desired. I used boneless pork loin chop for this soup but nearly any pork will work in this soup. I prefer this cut because it is easiest to chop into chunks and it's very lean.